This video is specifically written to teach the names of the offspring and the gender names of their parents. It also highlights that for many animals the offspring look like similar smaller versions of the parent animals. For others though, the offspring may look very different and go through several life-cycle stages called METAMORPHOSIS. 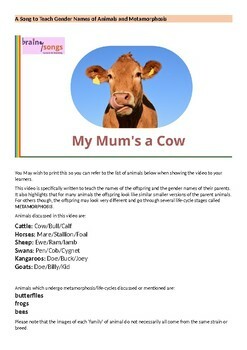 Please note that the images of each ‘family’ of animal do not necessarily all come from the same strain or breed.